Troy Turner is frank when he talks about his family's roots as moonshiners in the South; his mother's family made whiskey and his father's family transported and sold it. While Tatoosh Bourbon is based off a 100-year-old recipe, Turner is the first to admit that the bourbon he makes is much likely better than the original stuff. Together with Mark Simon, Troy makes Tatoosh from locally grown grains, including barley that is grown in a field that can be seen from the distillery. The mash bill here is about 70% corn with the remainder comprised of equal parts rye and barley. 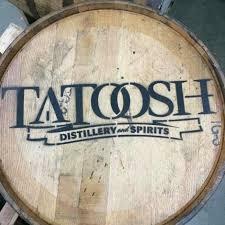 Utilizing small stills with tall necks to produce a spirit that is smoother in character, Tatoosh is distinct for a distillery of their size, aging their Bourbon for three years in American Oak casks (Char #3, 47-gallon), which are continually turned and rotated every three to four weeks.